Antoine Griezmann starred for France at Euro 2016. ANTOINE GRIEZMANN HAS reached a deal to join Manchester United in the summer, according to reports coming out of France, with the English club believing that it already has a basic agreement with the striker. 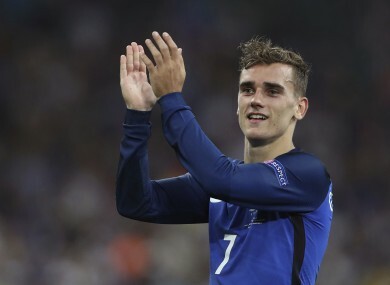 Yahoo France reports that Griezmann has agreed to personal terms with the Premier League club, settling on wages that will reach £15 million (€17.6 million). The deal is not yet complete however, as Atletico Madrid wants United to pay the full amount of Griezmann’s release clause, set at £85m (€100m). If the deal is completed, Griezmann would then swap the Vicente Calderon Stadium for Old Trafford, while taking Memphis Depay’s now-vacated number seven shirt. The addition of Griezmann may also lessen the likelihood of Wayne Rooney returning to the Red Devils next season. Griezmann himself has mentioned speaking to United star Paul Pogba regularly and has stated his admiration for the club. The striker has also said that he doesn’t see himself moving at the moment, though he admits to wanting to play beside his France teammate. Email “Man United close in on €100 million Antoine Griezmann deal - reports”. Feedback on “Man United close in on €100 million Antoine Griezmann deal - reports”.